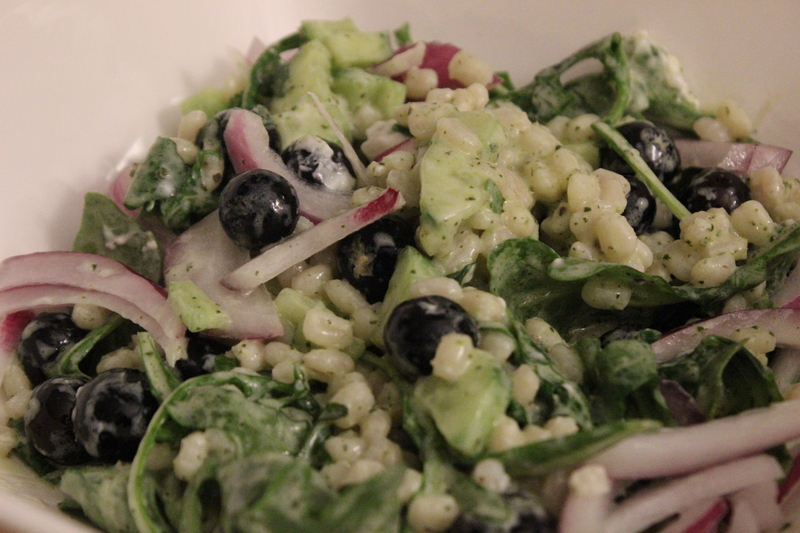 Blueberry Barley and Mint Salad. The last couple of days have been both joyful and deeply sad. We celebrated our friends’ marriage over the weekend with a beautiful ceremony in Brooklyn, and today, I turn 31. We also lost my husband’s grandmother this past weekend. Mimi, as we all called her, has acted as a stand-in grandmother for me over the past decade. She made us hand-knit slippers at Christmas and cooked the best French toast man has ever tasted. She stocked her freezer with Peppermint Patties for the women in the family and her fridge with Yuenglings for the men. She was an amazing mother, grandmother, and all-around person. Last night, we made this salad, inspired by Cooking Light, as a way to nurture the soul a little bit. Salt the water, add the apple cider vinegar, and bring to a boil. Add barley and cook until all the water is absorbed, about 15 minutes. Meanwhile, chop all of your vegetables and place in a large salad bowl with the arugula. Add mint, olive oil, salt, pepper and lemon juice to a blender or food processor and blend until smooth. 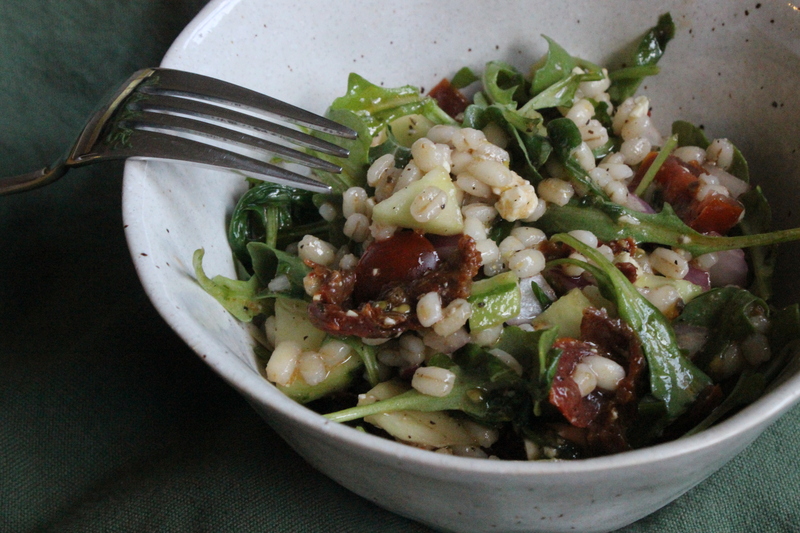 Add hot barley to the vegetable mixture, add goat cheese, and toss thoroughly with dressing. Even if you think this is weird – especially if you think this is weird – give this a try. THe Husband, who doesn’t like blueberries or red onions, (& doesn’t think of salad as a “real” meal), went for seconds. And then brought the rest for lunch. 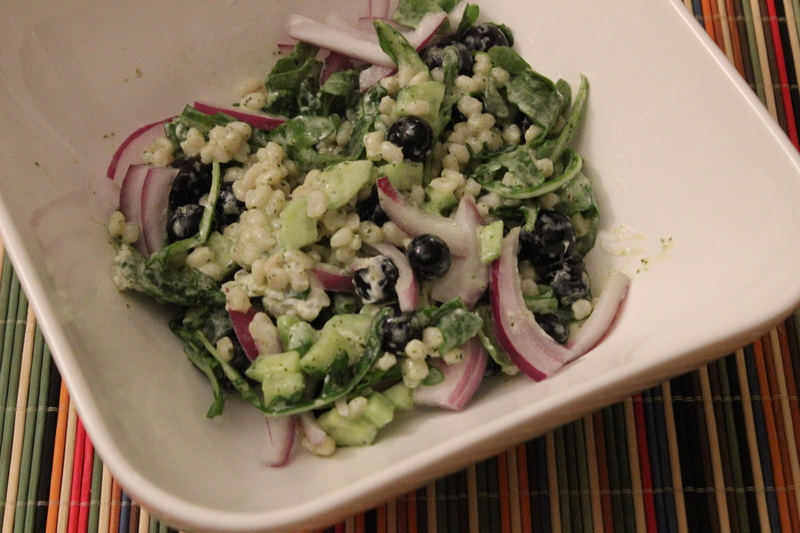 Posted on May 27, 2015 Author varinajCategories salad, vegetarianTags arugula, barley, blueberries, cooking light, cucumber, goat cheese, onion9 Comments on Blueberry Barley and Mint Salad.